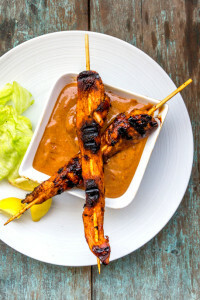 This BBQ chicken satay has all the smoky flavors thanks to the homemade BBQ sauce and it goes to the next level when teamed up with the flavorful Thai peanut sauce! I am hooked! And I bet you will be too! Once you try the homemade barbecue sauce which I made last week, you will simply not get over it. I had quite a bit of the leftover sauce and what could be better than a BBQ chicken satay! I had BBQ chicken satay in restaurants many a times and each of them has their own version. I loved them all. I don’t know if it is because of the chicken satay or that wonderful peanut sauce, I could never have enough of it and always keep craving for more! I very comfortably assumed that peanut sauce is something very difficult to make at home and so never bothered about it. It is when I decided to make these BBQ chicken satay that I started looking for the perfect dipping sauce to serve it with. And then appeared my favorite peanut sauce! Oh man! How could I never thought of making it at home! It is so ridiculously easy! And taste? Oh don’t ask me! I bet you will get hooked too! I used a grill pan for making these chicken satays on the stove top. This piece of cookware comes in very handy when you want to grill something quickly while making other things for dinner especially when your oven is busy in baking other good stuff. But off course you can grill these chicken satays in an oven [at 200 C/ 400 F] or even outdoor grill. 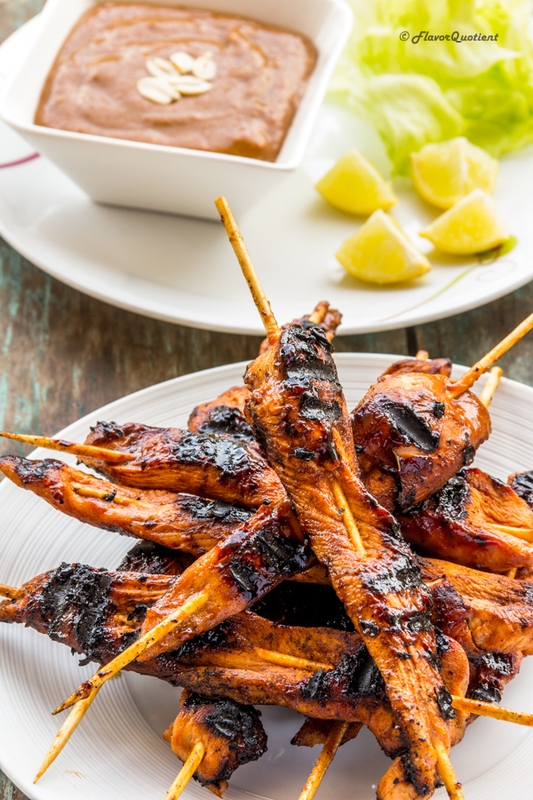 Don’t worry if you chicken satays burn a bit while grilling as this may happen due to the sugar in barbecue sauce. 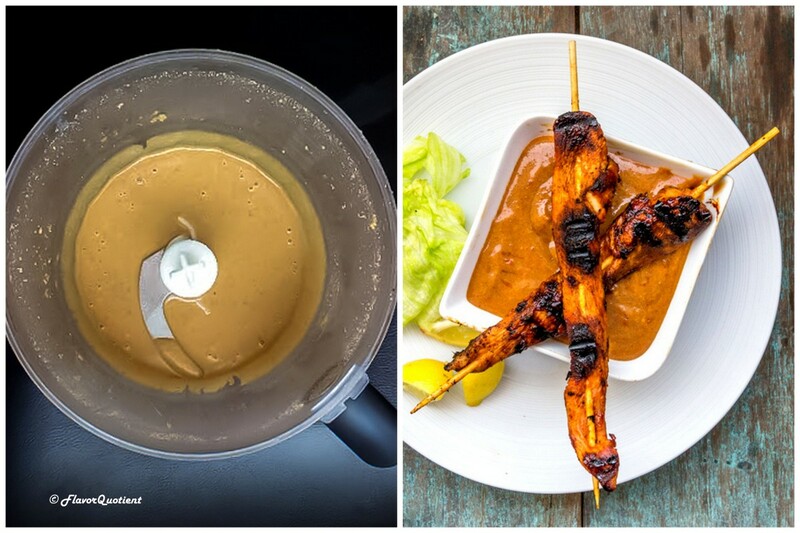 While devouring these satays with my favorite peanut sauce, I was wondering what could be some other apparently intimidating recipes I love to eat at restaurants but didn’t venture to make at home yet! Any suggestions? First we will make peanut butter out of the peanuts. [You can use readymade peanut butter, about ½ cup, to make the sauce and skip this step of processing the peanuts.] Put the peanuts in the food processor and using the chopping blade process them until chopped finely. Keep processing the peanuts until you see that the peanuts have started releasing oil. This will take a while, about 5 minutes or more depending on the power of your food processor. To help process the peanuts, you can drizzle the vegetable oil [if your peanuts are very oily, you can skip the oil]. Once the peanuts are all chopped up and becomes a smooth paste, your peanut butter is ready. In a saucepan, combine the peanut butter and all the other ingredients listed under peanut butter ingredients. If you have already added vegetable oil while processing the peanuts, skip it at this point. For readymade peanut butter too, you can skip the oil. Put the saucepan on medium heat and whisk to combine everything well. Set the sauce simmer for about 5 minutes or until thicken. Transfer to a bowl and let it cool. Cut the chicken breast lengthwise into long strips. 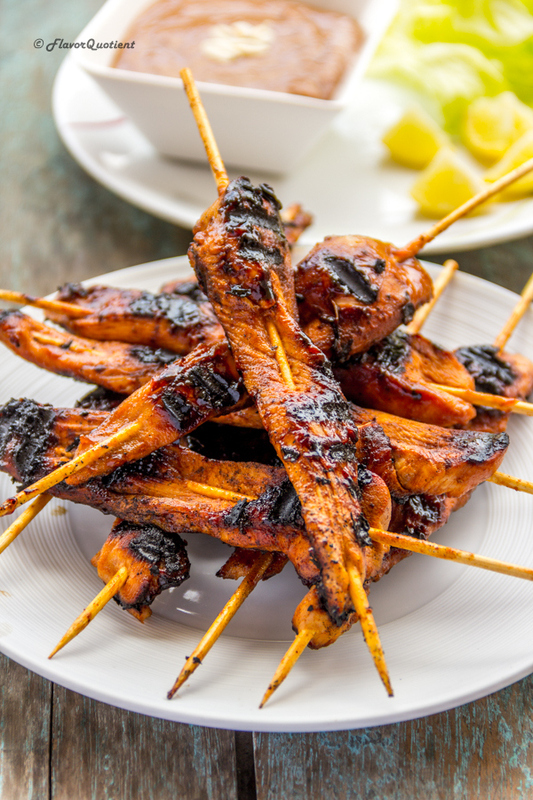 Marinade the chicken in half a cup of homemade barbecue cause for 2 to 3 hours or overnight. Soak satay sticks in water for at least half an hour to prevent them from burning while grilling. Insert one satay stick in each strips of chicken breast lengthwise. Heat a grill pan to very high heat and brush it with some oil. Put the satay sticks on the hot grill pan and brush them with the remaining barbecue sauce. Flip them over and brush other side also. Cook them for 3 minutes each side until the chicken is all cooked through and no pink is visible. 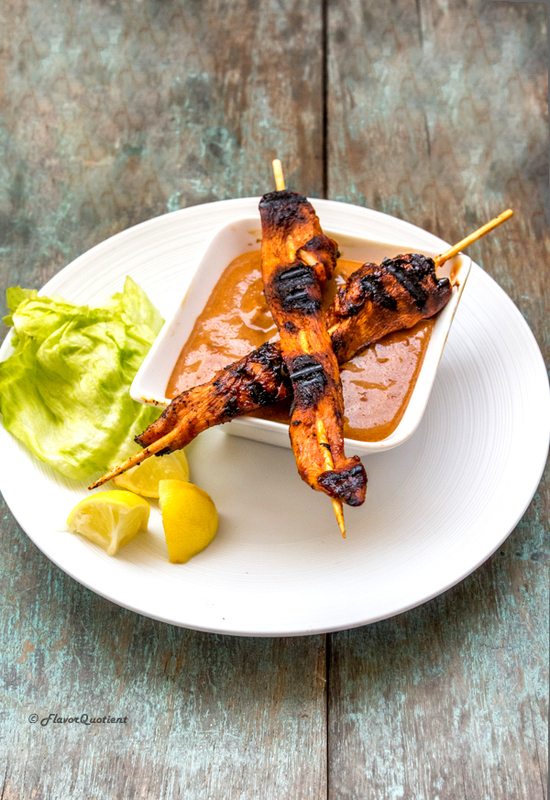 Serve the warm chicken satay with the tangy peanut sauce and some lemon wedges.